When it comes to world-class employees, few organizations rival Disney. Famous for their friendliness, knowledge, passion, and superior customer service, Disney's employees have been fueling the iconic brand's wild success for more than 50 years. The Disney University, founded by Van France, trains the supporting cast that helps create the world-famous Disney Magic. Now, for the first time, the secrets of this exemplary institution are revealed. In Disney U, Doug Lipp examines how Van perpetuated Walt Disney's timeless company values and leadership lessons, creating a training and development dynasty. It contains never-before-told stories from numerous Disney legends. These pioneers share behind-the-scenes success stories of how they helped bring Walt Disney's dream to life. Disney U reveals the heart of the Disney culture and describes the company's values and operational philosophies that support the iconic brand. Doug Lipp lays out 13 timeless lessons Disney has used to drive profits and growth worldwide for more than half a century. DOUG LIPP helped create the first international version of the Disney University, in Japan at Tokyo Disneyland, and then led the training team of the Disney University at the corporate headquarters of The Walt Disney Company, The Walt Disney Studios. 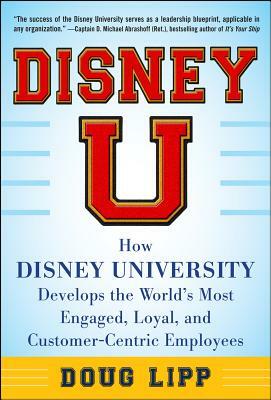 He mentored under a number of Disney University visionaries, including the Disney University founder, Van France. Lipp consults with numerous Fortune 100 corporations and travels the world speaking about the lessons he learned at the Disney University.